One conventional way of assessing hooves which most owners have heard of is to check whether a horse has the "correct" hoof/pastern angle. This is the line drawn from a lateral view between the hoof capsule and the limb; to be "correct" it should be straight. Commonly once a horse has a long term lameness it will have either a broken forward or broken back angle. But you already knew this, so why the blog? Well, once again there were 2 owners who prompted this blog. The first was this piece of research: http://www.eurodressage.com/equestrian/2012/08/28/effect-horse-shoes-equine-hoof-shape. Thanks to Annette, who owns Pocholo (from yesterday's blog) for this link. Its interesting because finally this research confirms what we already suspected: that shoeing (alone, in the absence of other factors including diet and exercise) will cause the hoof capsule to deteriorate - within 4 months (which was the term of the study). Significantly, one of the changes measured was a decrease in hoof angle - in other words more like the "broken back" hoof in the picture. Observing rehab horses, I've long suspected that we use hoof pastern angles the wrong way. A broken back angle, for instance, is certainly a symptom of a problem - its no coincidence that the 1st and 3rd hooves in the illustration look similar to many "before and after" shots of rehab horses - but to sort out the problem you need to address the cause, not just the symptom. Wedges are often used to create a hoof pastern angle which appears better - these photos of Ted, one of the rehabs, are a classic example. However the real problem is not the angle, but what has caused it - not just the shoes (as we now know from the research above) but the weakening of the frog and digital cushion. Over time, this leads to pain in the palmar hoof and as well all know, the consequences of that are all too often a toe first landing and DDFT damage. The solution is not to try and wedge the foot into an appearance of having a better hoof pastern angle but to strengthen the internal structures so that the foot is no longer collapsing behind. 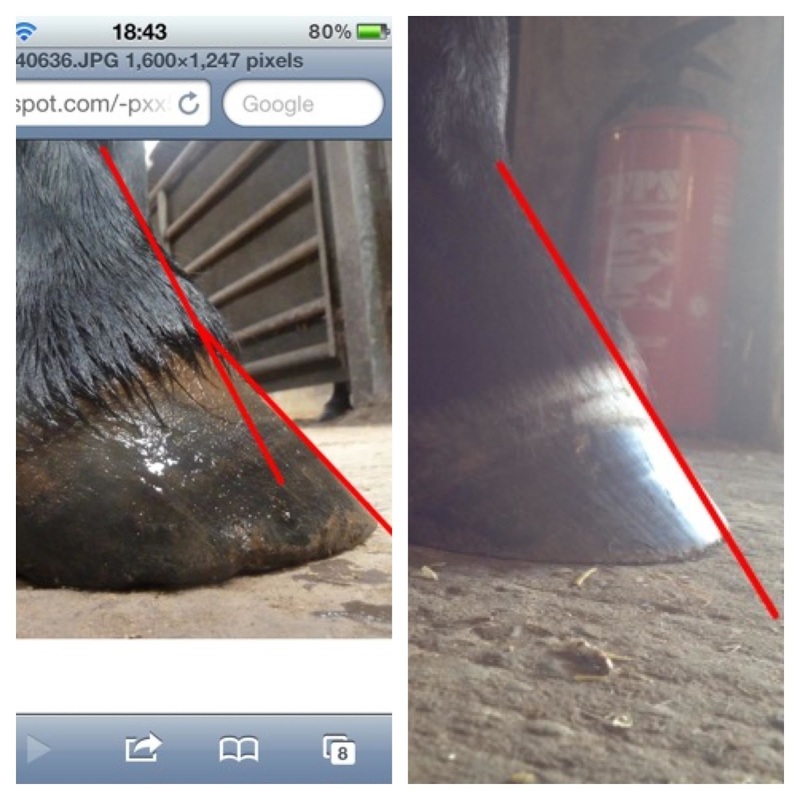 This shows you what I mean - 2 photos of the same hoof, contrasting (above) the hoof pastern angle when it was propped up with wedges versus (below) once he had been allowed to develop a strong, healthy palmar hoof. The angle in the lower photo is correct because the palmar hoof is so much stronger. The second person to prompt this blog was Amy, whose email I put up here on Monday. I'll let her carry on in her own words. "My vet was convinced (before we did the MRI) that Eva's lameness was conformational. He said that her feet were 'broken backed' - i.e. ideally the angle of the hoof wall and pastern should be the same, but the front of Eva's hoof wall was at a much shallower angle than the front of her pastern. He also took xrays which confirmed that her pedal bone was at a negative angle. His suggestion to fix this was bar shoes and wedges, to raise her heel and effectively realign the hoof/pastern axis. Since going barefoot, Eva's heels have come much further back (i.e the end of the hoof wall is now parallel with the frog rather than in front of it), and she has grown a much beefier and more supportive frog. Her hoof wall angle has also changed, and as I was reading your comment about conformation and writing this I though I would compare the hoof pastern axis to see if it is closer to the 'parallel' angles that my vet kept banging on about trying to achieve with the bar shoes/wedges ... and blow me, it is! Here is her right fore 3 weeks into rehab... the line clearly shows that the pastern angle is much steeper than the hoof wall angle [ie a broken back angle]. And attached is a photo of the same foot I snapped on my phone the other day (a bit rubbish sorry! I need more practise at it!) - and the same line shows that she has done a perfect job of achieving what my vet said needed to be corrected with shoeing. So her 'poor conformation' has actually changed as a result of going barefoot (or rather, it is now what it should be, and had previously been compromised by the shoes we were trying to use to 'fix' it!). Anyway - don't be too put off by concerns your vet may have about conformation. Both vets who saw Eva felt that she needed shoes to support the back of her foot - I think that she has done a pretty good job of proving them wrong ;-) ... and more importantly than scrutinizing pictures of her feet, she is very comfortable marching around on them!" This is so important, and so few horse owners (or farriers for that matter) seem to have a clue. There is a horse at the end of my barn aisle whose owner and farrier have him in huge wedge shoes to "correct" his pastern angle. And the farrier keeps telling the owner the horse isn't growing enough heel, and may never be able to be out of wedge shoes . . . hmm . . . (!!!) maybe there's a connection there? The owner has no interest in anyone else's opinions, otherwise I'd send her a link to your post - her farrier is a "saint" who is "saving" her horse . . . Sigh . . .
:( Yes, I can see my Laz has a broken back angle in his healing RH hoof, for sure. We too, were a part of a mislead vet/farrier of shoeing/wedges/bars/etc until things just got so bad, I had them yank it all off thinking I was to put him down a few days later. Only when I saw him moving around more comfortably and with urging of my blogging readers to seek barefoot did I go "WAIT A MINUTE!!!!" and off on our journey we went. A long one, still in progress as I seek what puzzle pieces we are still missing but I struggle with his each leg literally having different angles! I may have to do a post about that linking back to your helpful info. I so wish we had a US Rockley!!! It's a very difficult place to be as a 1st time horse owner after years of wanting, and to be faced so quickly within 10 months of owning, to have your horse have laminitis and pull through it. Thank goodness for online reasources. My farrier said my mare was 'not growing any heel' and needed pads and bar shoes. I chose to disregard his advice - her feet used to be OK so if they are wrong now that can only be a result of the shoeing, she was getting increasingly short stepping and stumbly. So, against his advice (she'll never cope barefoot were his words), I've had her shoes removed, invested in some hoof boots and enlisted the help of Ross Barker to see if nature can resolve the problem for us. Even after just 2wks I think her digital cushion is looking better. "He can't go barefoot because..."
Medio-lateral balance - where to look?